OWENSBORO, KY — Bill Monroe, a virtuoso mandolin player and the father of bluegrass music, was born in 1911 and raised on a ridgetop near Rosine, Kentucky about 40 miles south of the bluff on the Ohio River where Owensboro is located. With every passing year the connection between Monroe, his birthplace, and this river city gets closer. That’s never more true than during the last weekend in June when Owensboro hosts ROMP, the River of Music Party, now a fixture in global consideration as the one of the best celebrations of bluegrass music in the world. This year’s ROMP festival, held from June 25 to June 28, added to that reputation and for very good reasons. ROMP’s organizer, the Owensboro-based International Bluegrass Music Museum, treats the festival as a showcase of 1) the traditional hard-driving bluegrass sound that honors Bill Monroe’s legacy, 2) a salute to the musicians and artists that expanded bluegrass music’s embrace of more rhythm and vocals toward the end of the 20th century, and 3) a coronation of the intricate, almost concerto-like complexity that the top young artists are incorporating into bluegrass today. Taken together over four days, ROMP builds a historical narrative of a quintessential American musical form told by superb musicians and vocalists from all over the United States and overseas. 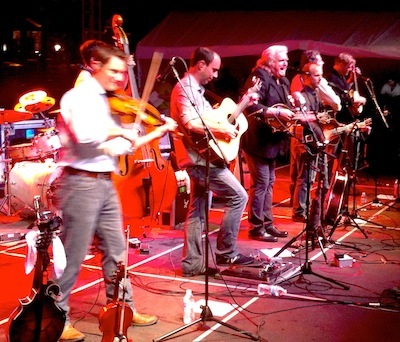 Doyle Lawson and Del McCoury, both members of the International Bluegrass Hall of Fame, are fixtures at ROMP representing the historic roots of the music. McCoury, a guitarist and lead vocalist, performed with Bill Monroe in the early 1960s. Lawson, a mandolin player, composed “Rosine,” one of his great recordings, to honor Monroe’s birthplace. This year the places reserved for the next generation artists who advanced the bluegrass sound were held down by Ricky Skaggs and Kentucky Thunder, his six-man band, and the Sam Bush Band. Skaggs and Bush are mandolin players and their big bands have repertoires that incorporate aspects of blues, country, rock and soul played with the traditional bluegrass instruments – standup bass, fiddle, guitar, banjo, mandolin, and dobro – Ricky Skaggs was particularly impressive, especially during a song that featured the band’s bass player, Scott Mulvahill. Still, the ROMP feature that I find most intriguing is the festival’s focus on the top young artists in American bluegrass music. Last year’s ROMP introduced southern audiences to The Boston Boys, who played an after party that drove a crowd of dancers to near delirium with original music — “Satisified,” “What You Say?! ?” “Amelia,” “Endless Creation”— that seems influenced by strains of The Allman Brothers, Santana, and Stevie Wonder. The Boston Boys — Eric Robertson (lead vocals, mandolin), Duncan Wickel (fiddle), Josh Harri (bass), Nicholas Falk (drums) — were so good they were invited back this year to close ROMP’s second night. That night The Boston Boys followed a terrific performance by The Wood Brothers, out of Colorado. If both of these bands stay together with all personnel intact they are destined to accomplish very big things. Some of the other really fine new generation bluegrassers at ROMP this year were Sarah Jarosz, a mandolin and guitar player and sweet, sweet 23-year-old vocalist who was accompanied by Alex Hargreaves (fiddle) and Nathaniel Smith (cello). Hargreaves and Smith also performed on Friday evening in a new group, The Brotet, with Dominick Leslie (mandolin) and Samson Grisman (bass). Their sound, as involved and searching as a symphony score, debuted at ROMP and received a rousing response from an audience that numbered more than 7,000 people. Later, Grisman performed in a trio with his father, David Grisman, a renowned mandolin player, and guitarist Jim Hurst, who once drove truck in Ohio before his wife convinced him to move to Nashville to pursue his musical career. One of the songs of their hour-long set featured both Grismans in an enchanting, call-and-response, father-son duet. Phoebe Hunt, a fiddler and vocalist, performed with Connor Forsyth, a piano player from Austin, Texas, and won the hearts of the festival’s packed lawn with her original song, “Romping the Night Away.” Pokey LaFarge, a great talent out of St. Louis, performed Saturday afternoon. The Luke Bulla Trio out of Nashville was wonderful. 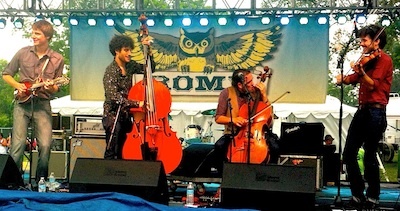 Christian Sedelmyer, a fiddle player, David Goldenberg, a mandolin player, and banjo tour de force Noam Pikelny performed and are regulars at ROMP. So is the 23 String Band, one of whose founding members, mandolin player Dave Howard, was raised in Owensboro. Also featured as a kind of comedic solo act was Rushad Eggleston, a cellist and one of the founding members of Crooked Still, whose 2004 debut CD “Hop High” is one of the fabulous new generation bluegrass albums. A couple more things of note. Developing a festival with such a pure narrative, and now attended by over 20,000 people annually, takes work. A year, in fact, of planning, contract design and settlement, vendor agreements, sponsor solicitation, fund raising, volunteer recruitment and training, and collaboration. 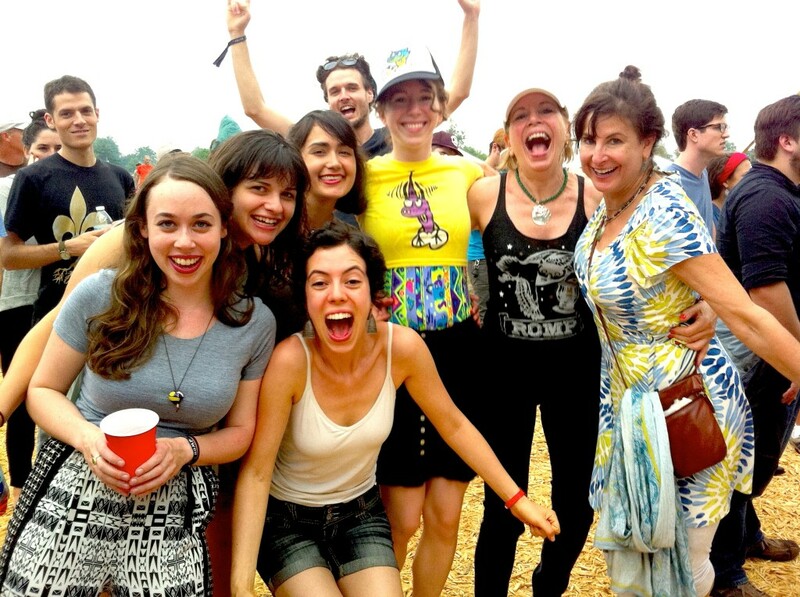 In every way ROMP is a community event. The city, led by Mayor Ron Payne, provides funding. Daviess County, led by County Judge Executive Al Mattingly, provides Yellow Creek Park, the beautiful venue that easily holds the festival’s big and modern scaffold staging, dozens of vendors, camping sites for thousands, and room for the crowd of families and professionals and students and musicians that have put ROMP on their annual calendars. Organizing the event is the International Bluegrass Music Museum, which has succeeded in elevating bluegrass music into a featured role in Owensboro and Daviess County’s strategic economic development plan. Gabrielle Gray, the museum’s executive director, has rightly earned her reputation as a driving force in bluegrass music, in organizing ROMP, and in promoting bluegrass events and education in and around the city. This year, in a new venture, she is working with Brescia University and Owensboro Community and Technical College to establish a bachelor’s degree in bluegrass music. She’s also playing an important role in planning and raising money for a $12.5 million International Bluegrass Music Center to be constructed at the center of Owensboro’s riverfront redevelopment district. The city and Daviess County have pledged big investments in the new building. Gray is assisted by a veteran staff and an accomplished and engaged board. They include Terry Woodward, whose long career in music marketing shaped the city’s vision to be as identified with bluegrass as Nashville is with country music, and Memphis is with the blues. Among the other 21 board members are Chris Love, an Owensboro business executive, Mike Simpson, a Bowling Green, Ky. real estate entrepreneur, Denise Jarvinen, an economist from Brookline, Mass., and Richard Brown, a dentist and mandolin player from Cambridge who teaches at Harvard. Brown and his wife, Margaret, and their Reunion Band played this year at ROMP. The museum’s board chairman is Peter Salovey, a bass player and president of Yale University, whose Professors of Bluegrass band played at the 2013 ROMP. In almost every way conceivable ROMP reflects the capacity of great music to entertain, communicate, influence lives, and advance a region’s interest. As I’ve noted in previous ModeShift articles about Owensboro and the Ohio River Valley, the economy and culture of this interesting part of America is evolving in unexpected ways. Great people are organizing ROMP. Accomplished elected and appointed officials are putting their reputations and public dollars to assist in the festival’s development. Fabulous musicians, nationally known and soon to be, have found a home here. In an era of such national confusion, animosity, and uncertainty, ROMP is a beacon of excellence, a social and cultural masterpiece. The people who attend consistently used the word “fantastic” to describe their experience at this year’s festival. The music was superb. The atmosphere was friendly and secure. Owensboro and Daviess County leaders are doing so much to support their colleagues at the International Bluegrass Music Museum. This is the way America is supposed to work. THE PEOPLE OF ROMP from Messenger-Inquirer on Vimeo. I went one time and due to my having MS, the heat was too hard on me. I did go to the Thursday evening show at the River Park. If they would bring that back, I would go again. Great story, Keith. Good music will always bring people together.